Fig. 5. 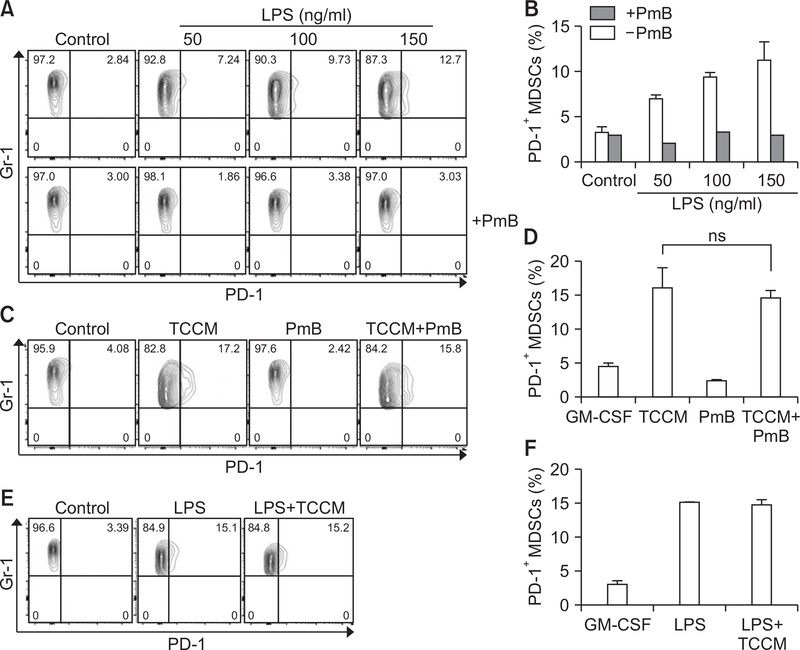 LPS stimulation induces the PD-1 expression on MDSCs. The CD11b+ cells were cultured in fresh medium in the presence of 10 ng/ml GM-CSF and then pre-treated with PmB (100U). Next, LPS (A, B) or TCCM (C, D) was treated in cells. (E, F) The CD11b+ cells were cultured in fresh medium in the presence of 10 ng/ml GM-CSF, in the absence or presence of LPS and TCCM. The cells were collected on day 4 for cell analysis. The experiments were independently performed at least 3 times.